Before this season, the Pleasant Plains girl’s volleyball team hadn’t won a sectional. Now the Cardinals are Class 2A state champions. 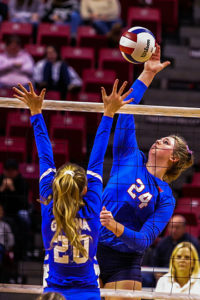 Using a balanced attack, Pleasant Plains (34-6) put together some key spurts and went onto a 25-18, 25-20 victory over Galena in the IHSA Class 2A state championship match Saturday at Redbird Arena. It was the first state championship in a girl’s sport for the Cardinals. They did by leaving it all out there. Edwards (6 kills, 2 aces) was part of the balanced attack. Senior outside hitter McKenzie Smith (7 kills, 9 digs), junior middle hitter Anna Kanllakan and junior outside hitter Macy Kanllakan (5 kills each), along with junior setter Emily Long (14 assists) all contributed for the Cardinals. Galena (36-6) was also making its first appearance in the state finals. Senior outside hitter Morgan Wills (9 kills, 10 digs), junior middle blocker Sami Wasmund (7 kills, 10 digs), senior setter Drew Wasson (18 assists) and senior libero Samantha Stoffregen (15 digs) all contributed for the Pirates. After losing the opening set, the Pirates tried to take it to a third set by jumping out to a 5-1 lead in Game 2. But the set tightened and had seven ties and six lead changes. Galena still led 18-17 when Smith smashed a kill to start a 6-0 run, which included a let ace by senior defensive specialist Jade Garrett (7 digs). Moments later, Edwards put down the match-winner. 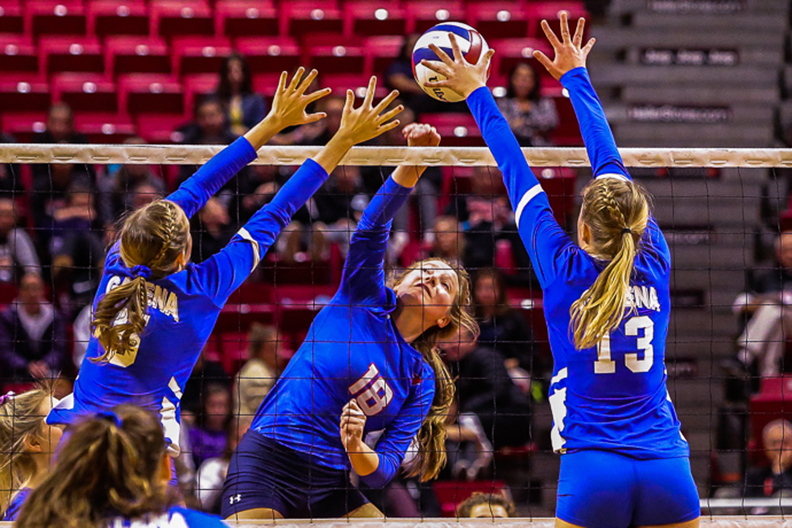 Pleasant Plains had 13 matches that went three sets during the season, winning 10 of them, including a thrilling 25-22, 15-25, 26-24 victory over Champaign St. Thomas More in the semifinals. Trailing 3-2 in the opening set, the Cardinals went on an 8-2 burst to take the lead for good. Galena clawed back within 12-11 before another Cardinal outburst, this one an 11-2 run, gave them a 23-13 lead. Pleasant Plains lost its final two matches on October 20, the last day of the regular season, at the Quincy Notre Dame tournament. 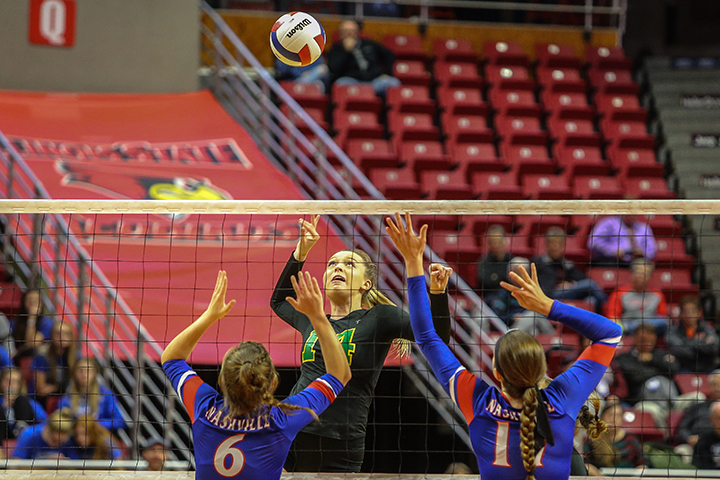 This was a different Nashville team than the one that was routed 25-14, 25-2 by Galena in Friday’s semifinals, but the Hornettes still came up short in the Class 2A third-place match against defending state champion St. Thomas More. Six-foot-2 junior middle hitter Allie Trame blasted 17 kills for St. Thomas More (37-5), which also got 7 kills and 8 digs from 5-8 senior Kayla Brandon, 6 kills and 10 digs from 5-6 freshman Anna McClure and 31 assists from 5-10 freshman setter Caroline Kerr. Senior middle hitter Bailey Melton had 9 kills for Nashville (32-10), which led at 10-8 in each of the last two games but was quickly overtaken by the Sabres. Nashville also got 5 kills from senior outside hitter Jenna Harris, 16 digs from junior Abby Grabowski and 7 assists and 14 digs from Abby Wesslemann.